A few months ago a beautiful and generous reader named Anca emailed me. She emailed me about this very polish, letting me know that there was a dupe of Deborah Lippmann “Across the Universe” at the drugstore. Across the Universe is one of my favorite polishes of all time and I hoard my bottle like a crazy person. I try to never buy polishes that I think I have dupes of, but I purposely hunt out dupes of Across the Universe. I knew about the Essence polish that was supposed to be a dupe, but unfortunately for me and a ton of other people in the US, we don’t get the full line of Essence nail polish. My Ulta has about 5 shades total. We began emailing and she very sweetly and generously offered to send me her back up bottle. Well, she ended up sending me the most AMAZING nail mail ever!! There aren’t enough exclamation points in the world to express how surprised and honored I was to have such a kind person send me amazing nail polishes! Anca, I can’t thank you again for all your kindness and generosity. Well, I promised I would do a comparison post between Across the Universe and the Essence polish, but I couldn’t help myself, I had to try out the Essence by itself first! 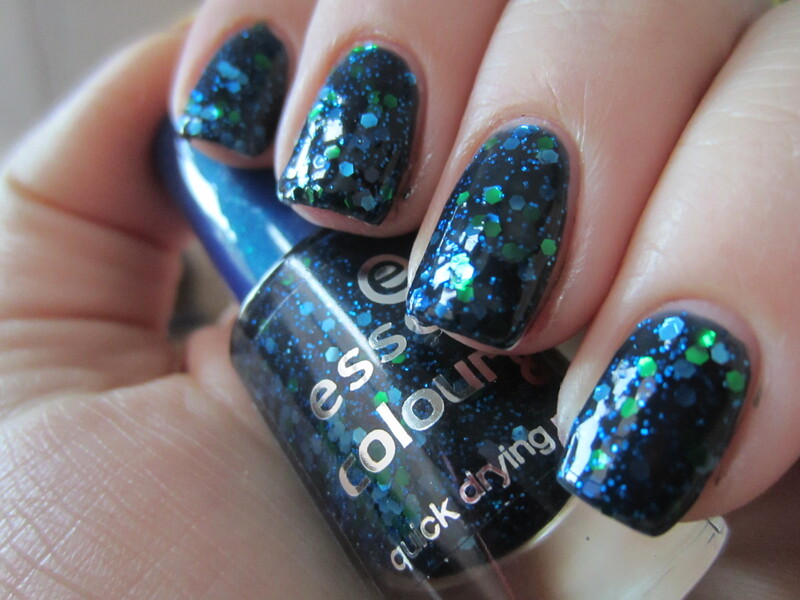 Essence “Blue Addicted” is a blue, green and light blue chunky glitter with light blue microglitter suspended in a dark blue base. The color is absolutely stunning! It is sooo similar to the Deborah Lippmann polish and really has a very similar depth and dimension. 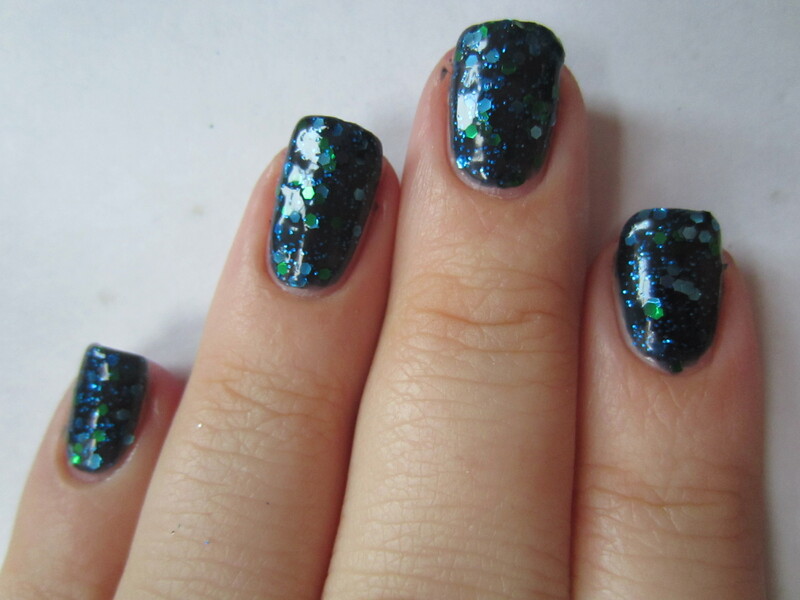 The glitters shine in every light and give it an “under the sea” type of look to it. The formula was just as nice. This is 2 coats, the first one I applied rather thinly and then the second I applied a little more thick. I think it would cover perfectly in 2 regular coats and that way would look the best. If you mess with this polish too much, the glitters move around and will leave bald spots. But that happens with all chunky glitters that I have. I’m going to save the comparison of formulas for my upcoming comparison post, but this formula was great. Its a little on the thicker side, but it dries pretty quickly. Be prepared to put 2 coats of top coat on if you want a smooth surface, but if you don’t mind a little texture, this polish is glossy enough that you may not need a top coat period. What do you guys think? Do any of you have any of the Deborah Lippmann dupes? Do any of you have this polish? And a very special thank you to Anca again! You’re amazing girl and I’m so happy and excited to have this (and all the other polishes) in my collection! Be prepared to see a ton of Essence and Catrice polishes! ← Nyx Retractable Eye Liner Review! thanks! yeah you guys in holland have some nice polishes! i tried out one of the catrice polishes she sent me too and its amazing!